This is the last week we will be studying birds. 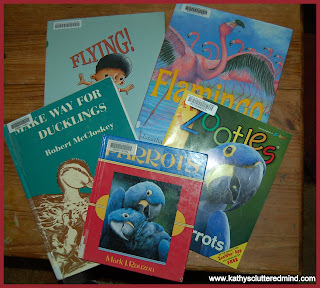 There is so much to learn about our Fine Feathered Friends and I know we didn't cover everything I had hoped too. But I am pretty sure it is one of those topics that the kids will most likely wish to do again when they are a little older. This week F is for Fine Feathered Friends. We learned about having birds as pets this week. 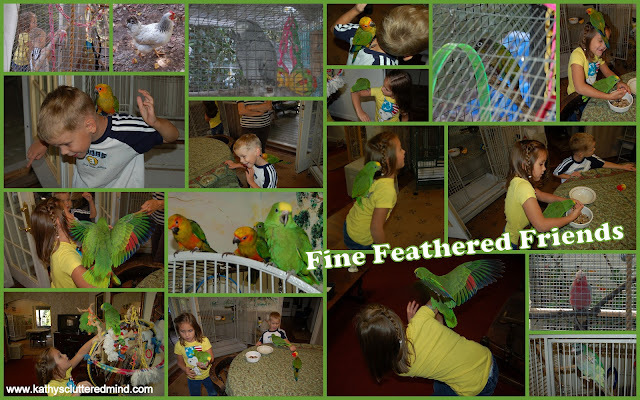 We discussed the different types of birds that you can have as pets, how to care for them and more. 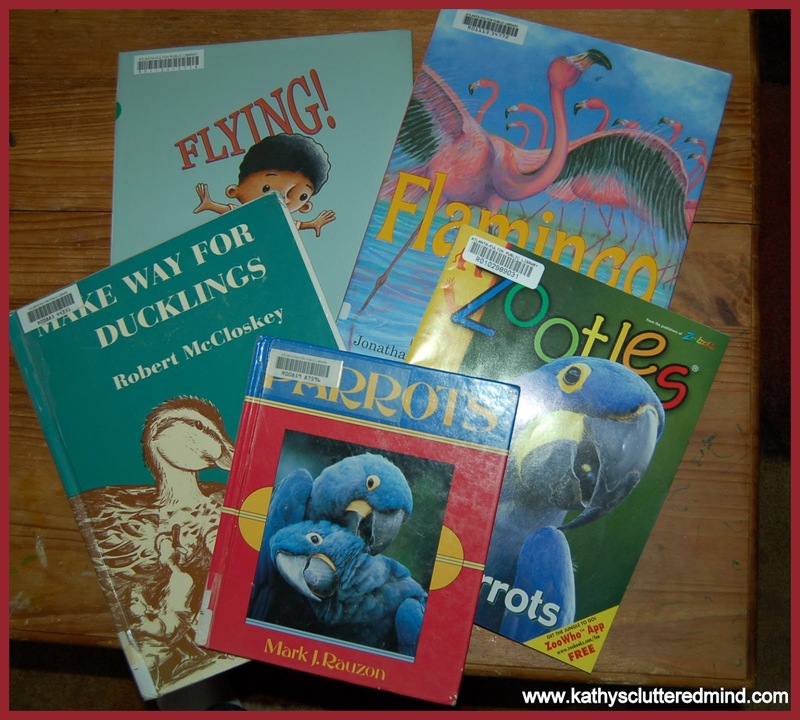 We also read several books on parrots and a couple on chickens since they can be pets too. Then kids painted a picture of what they would like their pet bird to look like. 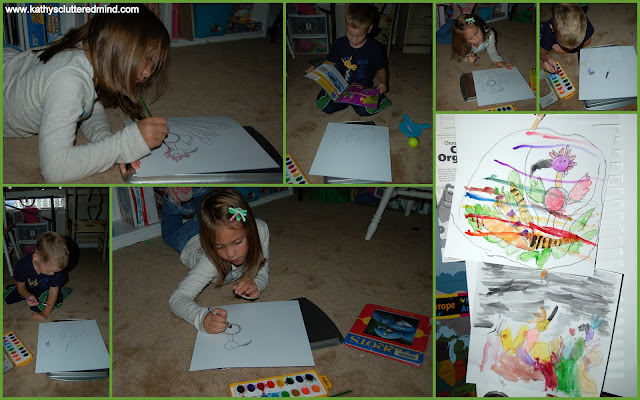 The kids drew their birds with black crayon then painted them in with RoseArt watercolors. Aren't they lovely? And we took our final bird unit study fieldtrip to a local Aviary. The kids got to pet, hold and even feed some Amazon Parrots and Sun Conures. We also saw a Ringneck Alexandrine Parakeet, a Ringneck Derbyan Parakeet, a Umbrella Cockatoo, a Red Breasted Cockatoo, African Grey and a few others. I am so grateful to Brightwood Aviary for opening their doors to our family. This fun, FREE, fieldtrip got high marks from Gwyn my animal loving 6 yr old who hopes to one day be a Veterinarian, Farmer or Zookeeper. We watched this video on "How to choose a pet bird." We also watched this fun video. We haven't gotten to this part yet but we will be using the Petsmart website to learn about the cost of owning a pet bird, pet bird care and choosing the right pet bird. The plan is to do this Friday. We may even make some bird puppets too. What kinds of scientific or art fun have you been having? Nice activities!! Thank you for sharing. What a wonderful study! Thank you for linking to Read.Explore.Learn! I will be featuring this post on the Read.Explore.Learn. Facebook page tomorrow. 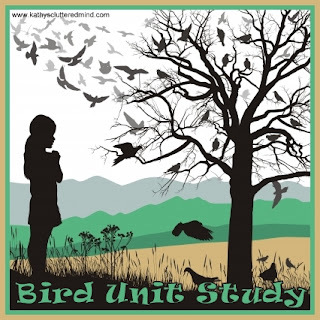 Love this, we will be studying birds this year too, pinning this! Thanks for sharing at FTF!! I was going to ask if you went to a pet store, but an aviary is even better! Pet stores and the like are some of my favorite field trips. FYI, the video isn't working right. I am stopping by to say this was one of the most popular links in October at the "Look! What We Did!" website. Thanks for linking up and I featured you!